I hope you enjoy your gift! I picked it out especially for you. And who am I? Well, that, as the kids say, is "for me to know and you to find out." But good luck! 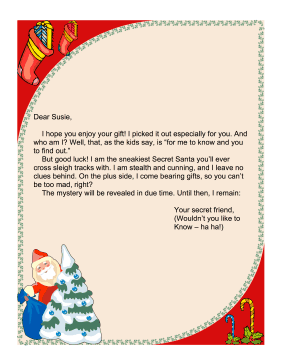 I am the sneakiest Secret Santa you'll ever cross sleigh tracks with. I am stealth and cunning, and I leave no clues behind. On the plus side, I come bearing gifts, so you can't be too mad, right?